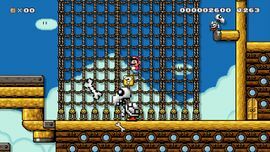 Big Dry Bones' Pirate Ship is the twentieth sample course in Super Mario Maker, set in the airship theme and in the Super Mario World style. The level starts in an area with a Dry Bones and some Cannons before reaching four doors. The one on the very right takes the player to an area with a Big Dry Bones and a beanstalk. The Giant Gate appears shortly afterward. This page was last edited on May 23, 2017, at 20:03.